I am excited to announce the launching of the SAIL 2 SURF project. SAIL 2 SURF will combine sailing and high-energy kayaking to promote minimal-impact adventure, and work with regionally-pertinent environmental non-profits by raising funds, promoting awareness, and hands-on participation. Matt Nelson is the team leader, and has sailed extensively in Alaska, British Columbia, and Mexico, including a three-year N. Pacific voyage in a 28-foot engineless sailboat, which included two ocean crossings. During this voyage, his passion for kayaking grew and he currently coaches high-performance paddling in surf, sea, and river environments (see bio on this site). In 2008 he was a part of a team of kayakers to successfully circumnavigate the entire Kenai Peninsula, AK while raising funds for an environmental non-profit, Cook Inletkeeper (see blog at ourowntwohands.blogspot.com). 34-foot trimaran, Lung-Ta, at anchor. Matt has been involved in various kayak-related films, is a team paddler for P&H kayaks, and teaches at symposia internationally. SAIL 2 SURF is a sail-supported adventure, accessing prime high-energy paddling destinations, specifically the numerous tidal rapids of British Columbia, outer-coast surf breaks of Vancouver Island and Calvert Island, and remote locations along the California and Baja coast. 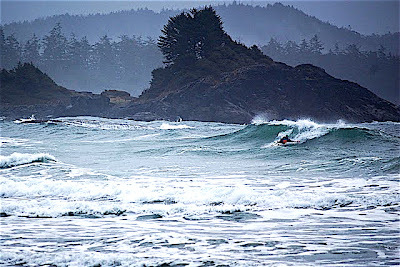 Surfing outer-coast breaks in sea kayaks. Magical. Following is an initial outline of the aim of the expedition, which will evolve as sponsorship, crew, and integration of fund-raising arise. 1) To sail to the N.E. 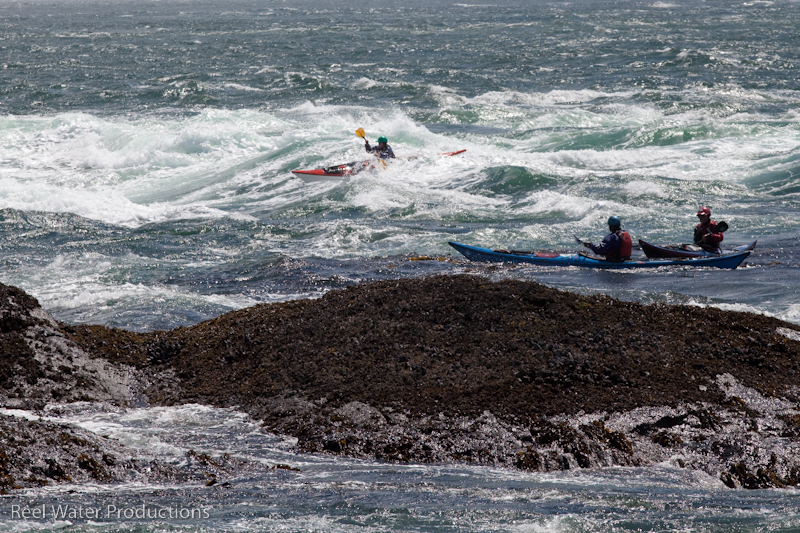 corner of Vancouver Island (Quadra Island region), Calvert Island, and the west coast of Vancouver Island without the use of fossil fuels, using kayaks and SUP to explore and surf as many of the tidal rapids as is possible, and access hard-to-reach locales of ecological interest, increasing intimacy and connection with the coastal ecology. With the onset of autumn the vessel will continue south down the west coast to Mexico, exploring surf breaks for kayaks and SUP, assisting as opportunities arise, and sharing the adventure with interested audiences via video and still image presentations. 2) To perform field research and sampling using the sail vessel and kayaks as a base-of-operations, and assist in data collection for research projects where our location and experience can be an asset. SAIL 2 SURF has established a relationship with Adventurers and Scientists for Conservation in an effort to facilitate research and data collection for an ongoing study. (http://www.adventureandscience.org/index.html#open) and hope to participate at a tangible, hands-on level, while continuing our adventure. 3) To share the adventure with the greater community via a short (1/2 hour) documentary and presentations: Documenting the process as well as the voyage: The process of turning ideas into real action is empowering and inspiring, and it alone constitutes ample material for a short film. The personalities on the team, and the mission with its inherent beauty and challenges, will assuredly create an interesting story and istunning imagery. 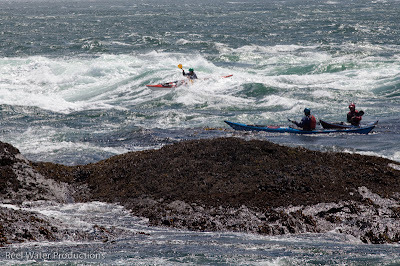 We will acquire written and video material to be used in instructional video episodes specifically addressing kayaking skills in tidal rapids and surf in sea kayaks, surf kayaks, and SUP. Tidal overfalls on a rowdy day! We look forward to sharing more specifics about route, the sail vessel, sponsorship, and opportunities to facilitate/conduct research, as the project gains momentum, so please keep checking this blog for periodic updates.